Lukas Josef Podolski ( born Łukasz Podolski ) is a German footballer who plays as a striker or winger for 1. FC Köln and for the German national team. He is a left footed attacker known for his strong shot, technique and probing attacks from the left side. He joined 1. FC Köln in 1995 where he broke into the first team in 2003 and made 81 appearances for the club before moving to Bayern Munich. After three years in Munich with mixed success, Podolski returned to Köln. 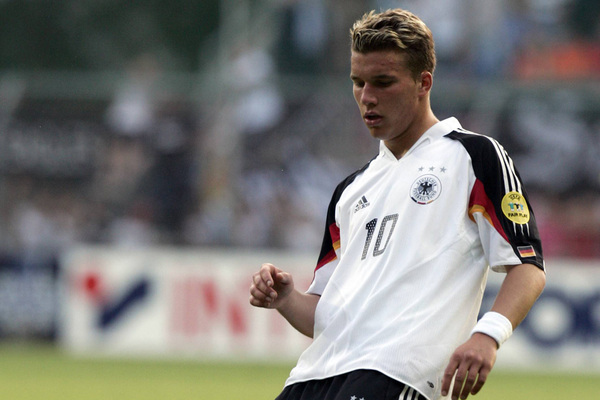 He was first capped by Germany in 2004 and has been part of the squad in all major tournaments since then. Although he was eligible to play for Germany and Poland, Podolski chose to play for Germany.